Jehanne remains in prison awaiting trial. Preliminaries are held without her being present until February 21st. During this time she receives visits from d’Estivet and Nicolas Loiselleur. They pretend to be fellow prisoners and from her home country as well. Loiselleur gives her news of her province to win her favor. He gets himself appointed as her confessor. He arranges for spies stationed in a secret room next to her cell to overhear Jehanne’s confessions, and also reports the confessions to the trial lawyers. The deception is justified by these so-called churchman, as being necessary under inquisitorial procedure to obtain the truth. Tuesday, the 20th – Jehanne is told she must appear at the trial the next day. She answers that she will willingly appear, but begs that ecclesiastics of the French party should also be represented in equal numbers as ecclesiastics of the English. Obviously Jehanne knows she is not going to receive a fair trial from the outset. She also asks that she be allowed to hear Mass before the trial. Wednesday, the 21st – Jehanne makes her first appearance in public. Jean Massieu escorts her from her cell to the royal chapel of the castle. She asks, and is allowed, to pray before the tabernacle in the chapel. D’Estivet severely reprimands Massieu for allowing this. Jehanne’s request to hear Mass is not granted. Her request for members of the French party to take part in the trial is ignored. Jehanne is seated before them. Jehanne at first refuses to take the oath, saying, "I do not know what you wish to examine me on. Perhaps you might ask such things that I would not tell." Whereupon they said: "Will you swear to speak the truth upon those things which are asked you concerning the faith, which you know?" She replied that concerning her father and her mother and what she had done since she had taken the road to France, she would gladly swear; but concerning the revelations from God, these she had never told or revealed to any one, save only to Charles whom she called King; nor would she reveal them to save her head; for she had them in visions or in her secret counsel; and within a week she would know certainly whether she might reveal them. Thereupon, and repeatedly, Cauchon admonishes and requires her to take an oath to speak the truth in those things which concerns the faith. 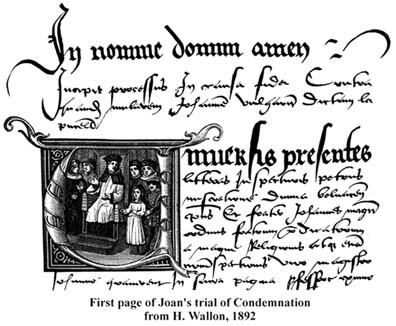 Jehanne, kneeling, and with her two hands upon the book, namely the missal, swears to answer truthfully whatever should be asked her, which she knew, concerning matters of faith, and was silent with regard to the said condition, that she would not tell or reveal to any person the revelations made to her. She is asked routine questions about her name, her parents, her godparents, and her baptism. She is asked to say her Paternoster. She responds she will, but only if they hear her in confession. Cauchon does not agree. She is told she is prohibited from trying to escape. Jehanne says she does not accept this prohibition and will not give her oath in this matter. That way she cannot be criticized if she does escape. What character Jehanne has! Here she is, tricked at every turn and wrongly held in a secular jail, and yet she is concerned as to her reputation to keep her word. She complains that she is kept in chains and irons. Cauchon responds it is necessary since she has tried to escape in the past. During much of the trial to follow, they will try to trick and confuse Jehanne with difficult and technical questions, but she keeps her composure and wits about her, much to their astonishment, as she is illiterate. She will be bombarded with several questions almost at once, so much so, that Jehanne has to ask numerous times that they let her speak. Often they will ask her the same question several days apart. Jehanne again amazes them, as she remembers that she has already answered that question and even refers them to the day of the transcripts. During the trial she maintains a good spirit, the angels will later encourage her to keep a cheerful countenance. Several times, as they read the transcripts back to her during the trial, she will ask that correct what they have written. One time she chides the clerk in a peasant’s humor that she will box the clerk’s ears if he doesn’t get it right (the joke falls flat in the courtroom). Several times she complains that they omit things in her favor from the transcripts (this will be an important point in the trial of nullification to come 25 years later that shows this trial is biased). Thursday, the 22nd – Jehanne is present at 8 a.m. She is required to again take an oath. At first she refuses, saying her oath yesterday was sufficient. They press her on the matter and eventually she agrees to speak the truth concerning matters of the faith. She says, "If you were well informed about me, you would wish me to be out of your hands. I have done nothing except by revelation." They ask her routine matters about her age, her childhood chores, her trip to Vaucouleurs, her trip to Chinon. They begin to ask about her voices and her meeting Charles. Friday, the 23rd – The trial is in recess. Jehanne hears her voices three times today – "Once in the morning, once at vespers, and when the bells were ringing for "Hail Mary" in the evening. I was sleeping and the voice waked me. And I thanked it, sitting up in my bed and joining my hands. I prayed it to counsel me in what I should answer, telling to ask counsel of our Lord in that. And the voice told me that I should answer bravely and that God would help me." Saturday, the 24th – The session again opens with a lengthy sparring over the oath. Jehanne is threatened by being declared summarily guilty if she does not take the oath they prescribe. Ultimately, they give in to her and she takes her usual oath. Many questions are asked and answered. Here are the highlights. 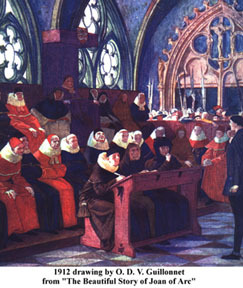 Jehanne tells Cauchon, "You say that you are my judge; take good heed of what you do, because, in truth, I am sent by God, and you put yourself in great peril,"
She continues, "I firmly believe, as firmly as I believe the Christian faith and that God has redeemed us from the pains of Hell, that the voices comes from God and at his bidding." Asked if she could persuade the voices to do her will and take a message to the King, she responds, "I do not know if the voice would obey me, unless it were God’s will and God permitted it. But for God’s grace, I could do nothing." Asked if she knows she is in God's grace, she answered: "If I am not, may God put me there; and if I am, may God so keep me. I should be the saddest creature in the world if I knew I were not in His grace." She added, if she were in a state of sin, she did not think that the voice would come to her; and she wished every one could hear the voice as well as she did. They further question her on her childhood activities and especially about the Fairy Tree. Tuesday, the 27th – Again the session opens with jousting about the oath. A lot of questions are asked about the angels that have appeared to her. 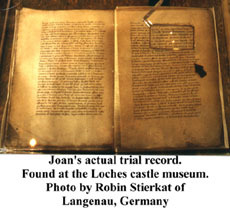 Many times Jehanne refers them to the record at Poitiers where she was first examined. They also focus extensively on her wearing of male clothing. They also examine her on the sword she obtained from the church at Saint Catherine de Fierbois, her armor and her banner. Next they talk about the attack at Orleans and the wound she received. One important point was regarding if she saw an angel over the King’s head when she saw him the first time. She responds, "By Blessed Mary! If there was, I know nothing about it. I did not see one." Thursday, the 1st – Jehanne again swears the oath in her own manner. They ask her about the different Popes at the time each vying for power. They read letters from the count d'Armagnac and Jehanne’s reply on this matter. The count had sought Jehanne’s advice, but she said she was too busy at the time and would advise him later. The judges were trying to trap Jehanne in church matters. They then show her the March 22, 1429 letter written to the English advising them it was God’s will to have France be free and that they would be driven out if they did not withdraw voluntarily. She says that before seven years are past the English will lose a greater stake than they did at Orleans, for they will lose everything in France. She adds that the said English will suffer greater loss than ever they did in France; and it will be a great victory which God will send the French. Asked how she knew this, she answers: "I know by a revelation made to me, and within seven years it will happen and I am much vexed that it should be so long postponed." She says also that she knew it by revelation as well as she knew we were at that moment before her. Asked when it will happen, she says she knew neither the day nor the hour. Asked in what year it will happen, she answers: "You will not learn that." (Within 6 years and 8 months, the English lose Paris to the French). They then ask her extensive questions about the angels. Jehanne says she sees them every day. They have hair, wear clothes and crowns on their head. They ask her if the angels have anything between their hair and their crowns. Jehanne says "No." (They are looking for evidence of horned demons). They ask her about her rings, which were taken from her. One is probably made from gold, although not fine gold. It is inscribed with the words "Jhesus Maria" and has three crosses. The ring has no stones in it. It was given to her by one of her parents. The other ring, not described, was given to her by her brother. They try to trap her into saying she used the rings to affect cures or invoke spells. They ask her about her knowledge of a mandrake, but she never had one, has heard it was evil and does not believe it had any powers. (A mandrake is a plant supposed to have magical powers, as it is shaped similar to a human body). She says the angels have promised to bring her to Paradise, and but for the daily comfort they bring her, she would be dead. They ask her about a crown being on the King’s head as she revealed her sign to him at Chinon, but Jehanne says she cannot answer without perjuring herself. The judges and assessors then spend then next few days meeting to discuss the case. Saturday, the 10th – The trial resumes in Jehanne’s prison cell. There is great speculation that Bishop Cauchon was losing the trial of "public opinion" as many citizens had become won over to Jehanne’s side by her steadfast faith and calm demeanor in the face of the judges sinister line of questioning. Also some assessors were beginning to show sympathy to Jehanne. To counter this, Cauchon had the trial moved to Jehanne’s cell and greatly reduced the number of assessors present. Jehanne takes the oath in her usual manner. They discuss her last few days before capture around Compiegne. They discuss her voices telling her she would soon be captured. Asked whether, if her voices had ordered her to make this attack from Compiègne, and had signified that she would be captured, she would have gone, she answers that if she had known when she was to be taken she would not have willingly gone; nevertheless she would have done their bidding in the end, whatever it cost her. They talk about her horses (she had five chargers and at least seven hacks used for traveling). Asked what sign she gave the king when she went to him, she replied it was fair and honorable, and most credible, and good, and the richest in the world. Monday, the 12th – There are two sessions today, one in the morning and one in the afternoon. Jehanne takes the oath in her usual manner. They continue talking about the crown. Regarding angels, Jehanne says that she frequently saw them among other Christians, but they were not seen (A Christian’s guardian angel perhaps). The angels called her "Jehanne the Maid, daughter of God." Asked whether the angel did not fail her in respect of the good things of fortune, when she was taken, she answers that she thought that since it pleased God, it was better for her to be taken prisoner. Asked whether the angel did not fail her in respect of the good things of grace, she answers: "How should he fail me, when he comforts me every day?" And she believes, as she says, that this comfort is from St. Catherine and St. Margaret. Asked whether she calls St. Catherine or St. Margaret or whether they come without being called, she answers: "They often come without my calling," and sometimes if they did not come, she would pray God to send them. Asked whether she sometimes called them without their coming, she answers "I have never needed them without having them." In the afternoon they ask her about her father’s dreams that Jehanne would be following the army (as a supposed prostitute) and that her father would have rather she be drowned that dishonor herself this way. They ask more questions about her men’s clothing. They ask her about the ransom of the Duke of Orleans. They ask her again about the sign to the King, but she defers, saying she must have council from St. Margaret. Tuesday, the 13th – Jehanne is again pressed on the matter of her sign to the King. "Would you be content if I perjured myself?" Asked whether she had sworn and promised St. Catherine not to tell this sign, she answers: "I have sworn and promised not to tell this sign, of my own accord, because I was too much pressed to tell it " And then she promises to herself not to speak of it further to any man. She then goes on to present an elaborate story of an angel bringing a crown, made of the finest gold, to the King. Most people doubt this story. Jehanne was repeatedly pressed on every side before literally being backed into a corner of her cell told this story. On February 27th she stated that she was not aware of an angel when she met the King. She repeatedly deferred comment until she asked them today "would you be content if I perjured myself?" Apparently they would. One aspect of the story that might give Jehanne away. She says that the Jean D’Alencon (along with her dropping many other important names) was present at the first meeting of the King. Jehanne should have remembered that she did not meet "her good duke" until a couple of days after first meeting the King. Of course, the English have no way of knowing this, and when dropping names, why not more the merrier? There also is a story that in 1377 Richard II entered London to become king and an angel descended to offer him a golden crown. Perhaps Jehanne heard this story and is using it for her own purposes. They ask her whether it was for any merit of hers that God sent her His angel, she answers that he came for a great purpose, in hope that the king would believe the sign, and men would cease opposing her, and to help the good people of Orleans; and he came also for the merits of her king and the good Duke of Orleans. They ask why he had come to her rather than to another, she answers that it pleased God so to do by a simple maid, to drive back the king's enemies. They then discuss various battles. Jehanne is almost trapped, in that the attack on Paris occurred on an important feast day to St. Mary. Jehanne states that is good to keep the feast day, but does not talk about the attack. Wednesday, the 14th – They ask Jehanne about her leap from the tower, again trying to say she was attempting suicide. She says that she asked three things of her voices: one was her deliverance; the second was that God should aid the French and keep the towns which were under their control; and the third was the salvation of her soul. She asks that if she is taken to Paris she may have a copy of the questions and of her replies, so that she may give them to the people at Paris and say to them "Thus was I questioned at Rouen, and here are my replies," and may not be worried again over so many questions. And then since she had said that we the forenamed bishop were exposing ourselves to great peril, by bringing her to trial, she was asked what that meant, and to what peril or danger we exposed ourselves, we and the others. She answers that she had said to us the aforesaid bishop, "You say that you are my judge; I do not know if you are; but take good heed not to judge me ill, because you would put yourself in great peril. And I warn you so that if God punish you for it I shall have done my duty in telling you." Thursday, the 15th – The session focuses extensively on the difference between the Church Triumphant and the Church Militant. Jehanne says that if she has done "any evil thing, contrary to the Christian faith which our Lord has ordained, I should not want to defend it, and I should be very sorry to go a contrary way." They also focus on her men’s clothing. Saturday, the 17th – In the morning session. They ask Jehanne if she will submit to the church, in respect to all her words and deeds, whether good or evil. Jehanne replies, "As for the Church, I love it and I would wish to support it with all my might for the sake of our Christian faith: it is not I who should be prevented from going to church and hearing mass! As for the good work I have done and my first coming, I must needs leave that with the King of Heaven, who sent me to Charles, son of Charles King of France, who shall be King. And you shall see that the French will very soon achieve a great task which God will send to the French, and such that almost the whole Kingdom of France will tremble. And I say it, so that when it comes to pass it will be remembered that I said it." They ask here if will refer herself to the determination of the Church. Jehanne says, "I refer myself to our Lord who sent me, to Our Lady, and to all the blessed saints in Paradise. It seems to me that our Lord and the Church are one and the same, and that no one should make difficulties about that. Why do you make difficulties about its not being one and the same?" They ask if God hates the English. Jehanne replies, "As to God’s love or hate for the English, and what He will do to their souls, I know nothing. But I do know that they will be driven out of France, except those that die here, and that God will send the French victory over the English." They ask if God was for the English when they were prospering in France, she answers that she knew not whether God hated the French, but she believed it was His will to suffer them to be beaten for their sins, if they were in a state of sin. Asked what support and help do she expect from our Lord in respect to her wearing men’s clothing, Jehanne responds, "For that as for the other things that I have done, I have not wished to have any other reward than the salvation of my soul." In the afternoon session they talk about the banner and the Pope. Saturday, the 24th – The transcripts of the questions and answers of the trial are read to Jehanne. Jehanne asks to be allowed to hear Mass the next day, which is Palm Sunday. Asked about wearing women’s clothing, Jehanne says, "Give me a woman’s dress to go home to my mother in, and I will take it. That would bring me out of prison, and when I am out of prison I will take counsel over what I should do." Palm Sunday, the 25th – Jehanne is not allowed to hear Mass. Jehanne says, "I could well be allowed to hear Mass as I am, which is my highest wish. But I cannot change my attire, nor does that lie in me. It does not lie in me to do it. If it lay in me, it would be quickly done." Jehanne speaks thus because she is following God’s will concerning wearing men’s clothing. Tuesday, the 27th – They meet in the room off the Hall of State. Jehanne is read the 70 articles of accusation and responds to them. They offer Jehanne counsel from among the assessors of the trial. Jehanne declines, "As for the counselor that you offer me, I thank you too: but I do not intend to forsake the counsel of our Lord." Jehanne is asked to submit to the Church Militant. Jehanne says, "But as for me I will not submit myself in respect to my deeds, save to the church in Heaven alone – that is, to God, the Virgin Mary, and saints in Paradise. And I firmly believe that I have not been faulty in our Christian faith. Nor would I wish to be." Wednesday, the 28th – The trial continues with the 70 articles of accusation and Jehanne’s response. Asked about her revelations, she says, "It lies with our Lord to make revelations to whom He pleases." "I believe, as firmly as I believe that our Lord Jesus Christ suffered death to redeem us from the pains of Hell, that they are Saint Michael and Saint Gabriel and Saint Catherine and Saint Margaret, whom our Lord send to comfort and counsel me. I shall call on them to help me as long as I live." Near the end of session, Jehanne says, "That Jesus has failed me I deny. As to the Church militant, I wish to show it all the honor and reverence that I can. As for referring my deeds to the Church militant, I must needs refer them to our Lord, who caused me to do what I have done. I am a good Christian. The offense that you bring against me I have not committed: as for the rest, I refer it to our Lord." Saturday, the 31st – This session is held in her prison cell. They again ask her to submit to the Church militant. Jehanne replies, "Concerning what you ask I will refer myself to the Church militant, provided that is does not command me to do anything impossible. I call this impossible – that I should revoke the things which I have said and done, as they are set down in this trial, concerning the visions and revelations which I have said that I had from God. Not for anything will I revoke them. And what our Lord has caused and commanded me to do, and shall command, I will not cease from doing for any man living. And it would be impossible for me to revoke them. And in case the Church wished to make me do something else, contrary to the commandment which I say God has given me, not for anything would I do it. I will refer myself to our Lord, whose bidding I shall always do. And I know that what is recorded in my trial came to pass at my Lord’s bidding. And what I have affirmed at my trial I did at God’s bidding, it would have been impossible for me to do otherwise." They ask her if she believes she is subject to the Church on earth, including the Popes, cardinals, archbishops, bishops and other prelates of the Church. Jehanne says, "Yes – our Lord first served!"